Project obstacles and solutions: There is no building on the Indiana University campus quite like Assembly Hall. In 2015, Indiana University began a $45 million renovation of its iconic basketball arena. The most dramatic change to the 45-year-old structure was the reconfiguring of the south entrance to include a new atrium with escalators reaching the second-level deck. From there, fans can get a glassed-in view of the court. 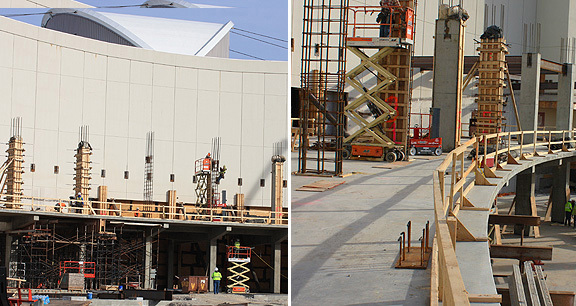 This opens into the arena and includes new box seating and a new club-level lounge. Shiel Sexton was selected as the general contractor for this project and poured the footings and exterior concrete. Verkler poured the concrete on the columns, slabs and decks. There were two key factors to the construction on this project. The first was this project had to be flawless, and that meant that the concrete had to be structurally sound and look good too. The south entryway was designed to be the grand entrance into the arena and to celebrate IU sports achievements of the past. Its high columns were designed to look like limestone pillars. IMI QC/QA designed a mix with a small coarse stone and a fine sand that compacted well and left a smooth finish when the forms came down. The walkways were designed with a colored concrete insert. IMI used a mix that included a macro-fiber to control thermal shrinkage in all of the outside walkways. IMI supplied 250 yards of integrally mixed crimson colored concrete for the inserts and 1,200 yards for the rest of the exterior hardscapes. The other key factor was the hard deadline. During the renovations, all athletic offices were vacated. The project needed to be completed before the beginning of the basketball season. IMI made sure concrete was delivered on time for each of the pours and was able to meet the demands of larger pours on the site. IMI supplied 3,000 yards of concrete for the Assembly Hall project. For more information on concrete for your project, contact the sales representative for the concrete plant nearest your location. Click here.